At Number 12, we’re looking at the race finishes. For a race that lasts for twelve hours, this is a race that has an uncanny knack of throwing up a particularly tight finish. In fact, across 2014, 2015 and 2016 there were been 2160 minutes of racing across the three races. The total winning margin, across all three races, was 3.72 seconds. And even though the 2017 race was won by nearly a full lap, those there or watching at home will remember the dramatic final half-hour where Mercedes threw everything at Ferrari to grab the victory when Jamie Whincup and Shane van Gisbergen traded paint at 280km/hr down Conrod. So even though the final results sheet showed the Ferrari in front by just over a full 6.213km lap, in reality the race was anyone’s right until the final stint. Like almost every race at Bathurst these days, you just never know. Only three times out of the last eleven races has the race been decided by more than a full lap – and even in 2013, won by the Mercedes SLS AMG of Bernd Schneider, Alex Rollof and Thomas Jaeger – the result was still anyone’s right until the flag, thanks mainly to a torrential downpour of apocalyptic proportions in the final hour of the race. One tiny slip up and he the race would have been anyone’s. As a contrast to that, the following year provided the closest ever finish in the race’s history as Craig Lowndes further enhanced his already quite remarkable Bathurst record by holding off a charging Mercedes to record his first 12-Hour victory. In the final pit stop of that remarkable race, HTP Motorsport elected to put fresh pads in their SLS AMG, giving young German ace Maxi Buhk the bes possible chance to get up the inside – or go around the outside – of Lowndes in the race to the flag. However try as he might, there was no way past the red Ferrari as Lowndes defended stoutly at Griffin’s bend on the final of a then-record 296 laps. The breathless finish saw the Ferrari hold on to win by 0.4138 seconds, still the closest ever. A year later the race winner was third when the race restarted with two laps to go: Katsumasa Chiyo launching his now famous charge to the front with one brilliant restart where he passed Laurens Vanthoor’s Audi before turn one and Matt Bell’s Bentley before turn two. The following year Chiyo-san was the star again: hunting down Shane van Gisbergen in the closing stages to reduce a 15-second deficit to just 1.2 seconds at the flag. Was it ever in doubt for the winning McLaren? SVG’s lack of stress post-race indicated that he probably had the situation under control. Still, it made for quite dramatic viewing. 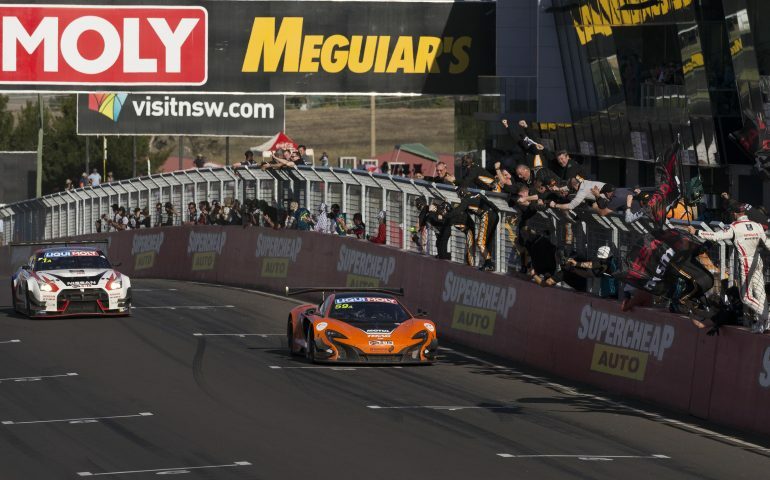 That’s the beauty of the Bathurst 12 Hour: It’s never over ’til it’s over..